Congratulations to Nathan Coda, our 2018 World Champion, and only the second World Champion to have "nathan" in their name! The following is an interview we did with him, conducted by email. If you want to find out more about his World Champion run, you can look at his writeup here. Nathan Coda (left) vs Rikki in the semi-finals. First tell us all a bit about yourself. What do you do when you aren't pushing plastic spaceships across a table? A little bit of everything. I work in downtown Chicago as a software engineer/architect, so that ends up being a big chunk of my life. In my free time I’ll catch a movie with my Wife (Deadpool 2 last weekend, Solo this weekend), take the dogs to the beach and watch them go nuts, or curl up with my cats and a good book (sci-fi or fantasy). And, of course, I like to get in some gaming whenever the opportunity arises. By now, many players have seen or heard about your list: What made you decide to go with a Rieekan squadron build with an MC80? I started running Rieekan Aces shortly before Worlds 2016. I thought I had “discovered” the list and was excited to show it off. Imagine how disappointed I was when I showed up and saw a field full of Rieekans. My version of the list at that point was running Admonition, which I’ve always preferred to Gallant Haven. I feel like a mixed force that provides both a solid squadron and ship threat is more challenging for opponents to deal with. With that in mind, it felt like upgrading Admonition to an MC80 was a natural progression of the list. As for why I ran Rieekan Aces - the consistency Rieekan can provide to a fleet is extremely powerful and is often clutch in competitive play, where you need to perform well all day. I’ve also played a lot of Rieekan, so I’m very comfortable with him as an admiral. I really enjoy the squadron game and they work well with Rieekan, so it made sense to run a squadron build. Then toss in the MC80 for a solid ship threat, and you’ve got my list. Tell us a bit about how you refined your list. What revisions did you make while you got it to the state it is in now? How did the recent FAQ effect your game plan? Prior to the FAQ, I’ve mostly just modified my squadron and Admonition loadouts between revisions. Should I put H9s on Admonition to hunt flotillas or put those points into squads instead? APT or ER? For squads, there’s the question of how many or what kind of escorts, what kind of heavy bombers (bombers that throw two dice), and what kind of space superiority squadrons. I want my list to be “all-comers,” so did a lot of tweaking to figure out how to balance the fighter complement. Then the FAQ came out, and mixed everything up (for the record, I’m pro-FAQ, just don’t love the timing). Dropping a flotilla put me down to 4 activations, which hurt. My flotillas all had a job, so I had to decide which one to drop (for those curious, I dropped my Adar Tallon/Boosted Comms/Bomber Command flotilla). Then I had a surplus of points to deal with. Upgrading Admonition to an MC80 spent those points, gave me my five activations, and gave me a ship with a little more presence than Admonition to boot. Having watched your semi-final game against Rikki, I saw you set up your squadrons perfectly with Fighter Ambush, and then do it pretty much exactly the same against Yik. Tell us a bit about your game plan with that objective. I tend to vary my squadron setup in FIghter Ambush depending on what squadrons my opponent is running. Since Rikki and Yik had similar squadron builds, my setup just ended up roughly the same. I don’t want to get too verbose about what exactly all my thoughts were on my squadron setup, but I will say that the squadron that forced my specific placements was the terrifying triple-tapping Ten Numbs. A chance at 3 auto damage to all my squadrons is a potential game over, so keeping him engaged with isolated escorts until I can find a good opportunity to finish him off is a big deal. Speaking of Objectives, you came in with an excellent plan for Fighter Ambush, but what were your other objectives, and how much would having selected them change your strategies? My other objectives were Advanced Gunnery and Superior Positions. Advanced gunnery basically doubles the threat of my MC80, which is generally a non-starter for people. Superior Positions allows for a clearer deployment advantage than Fighter Ambush, as well as being easy points for my rogue bombers in some situations. I was second player for all my games, and I’d like to think my objectives were unpleasant for most of my opponents. Describe what you were expecting to see at Worlds - did it meet your expectation, or did you have to change your strategy on the fly? Were there any matchups that you were hoping to not run into? With the FAQ drop, I had a lot of uncertainty about what I would end up seeing at Worlds. I figured there would be a bunch of Raddus and Sloane Aces, as well as fewer squadron lists and more MSU. So I think you could say I was mostly wrong about what I was anticipating. I felt like my list was a pretty good generalist list, though, so I felt pretty comfortable flying against whatever landed on the other side of the table. I think the worst matchups for my list are Sloane Aces and MSU. They’re certainly not unbeatable, but they pose certain challenges to my list. My squadrons are not as bomber heavy as the could be (no bomber command or Norra), for instance, so I can’t melt ships terribly fast, giving MSU lists too much time to gun down my flagship. 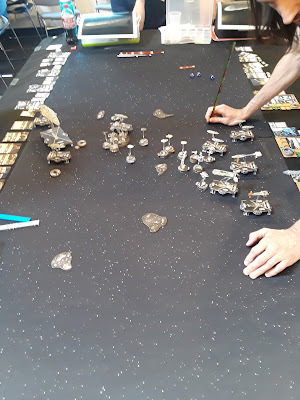 Sloane Aces have stronger space superiority than my list, so there’s a chance that they pick apart my squadrons before I can do anything decisive against them or their carriers. Honestly, I didn’t feel like my list automatically beat any other list I played against, but at the same time none of those lists automatically beat me either. That’s a space I like to be in. Tell us a bit about your preparation. What lists did you fly against? Where to you usually play: Vassal alone, or do you have a local scene? I like to think that I have two local scenes - an old one where I learned to fly in the Twin Cities, and a new one where I prepped for Worlds in Chicagoland. I flew against most of the major list archetypes, either against Chicagoland locals or playing solo on my kitchen table. I have tried vassal in the past, but I’m not terribly fond of it. I find that part of the enjoyment I get from Armada has to do with pushing actual plastic models around on a tabletop. It just feels so thematic. As long as I can get occasional games in with the local community, I’ll probably stick with that. The only Wave 7 upgrade you took was Strategic Adviser. How did that factor into your list? Without Strategic Adviser, I’m not sure I would have seriously considered bringing an MC80. I feel like 5 activations is kind of a sweet spot right now after the flotilla nerf, so was aiming for that with my list. I think having enough activations is especially important for a fleet that wants to go second, as it limits opportunities for opponents to last/first. Without Strategic Adviser, I likely would have either run Admonition and a Hammerhead or else run something else entirely. Anything you are hoping for in Wave 8 or beyond? That’s a tough one. I’m still really focused on experimenting with all the goodies from Wave 7 in a world with the FAQ changes, so I guess I haven’t spent too much time considering what gaps or roles in the game I would like to see filled. Just offhand - with the new limit to flotillas, it might be interesting to see some new flotilla options. They’re awfully common to have in lists, and some variety there could be interesting. Would love to see a new squadron pilots pack, similar to what we saw in Corellian Conflict. Maybe a new medium based Rebel and large based imperial ship? Whatever it ends up being, I’m excited to see where Armada heads next!